Prosperity88 | May you strike the mother lode! May you strike the mother lode! SEOUL: Leading LCD makers in South Korea and Taiwan are headed for a robust first half this year on improving demand for flat screen TVs, but performance for the last quarter of 2009 is likely to be hit by seasonal weakness and a strong currency, according to Reuters. The liquid crystal display (LCD) industry rebounded from a downturn last year thanks to China’s TV-buying spree and a shortage of key glass output that kept screen prices firm. The outlook is bright for the next few quarters as strong Chinese demand for screens used in televisions is lifting the sector from the seasonal downturn much earlier than expected. “We are heading into strong sales season in China, starting from the Lunar New Year holidays to the labour day,” said Mirae Asset Securities analyst Lee Hak-moo on Tuesday, Jan 19. DisplaySearch recently upgraded its global LCD TV shipment forecast for 2010 to 171 million units, a 22 percent increase over the 2009 estimate. “China is a hot growth engine for the global flat panel TV market as the transition from cathode ray tube to LCD and plasma TVs continues to drive market growth,” the research firm said. China is set to become the world’s biggest LCD TV consumer in 2011 and LCD makers are pumping in billions of dollars to build factories to capitalise on its huge potential. But LCD makers’ earnings deteriorated in October-December after peaking in the third quarter as seasonal weakness dented panel prices. The stronger Korean won is also expected to have weighed on earnings at Samsung Electronics Co Ltd and LG Display Co Ltd, the world’s top two producers of LCD screens. No. 2 player LG Display is set to report an operating profit of 445 billion won (US$394 million) in the fourth quarter, according to Thomson Reuters I/B/E/S. But according to StarMine SmartEstimates, which predicts future earnings by putting more weight on recent forecasts of top-rated analysts, LG Display’s operating profit is likely to show a downside surprise of 21 percent. Taiwan’s AU Optronics Corp is expected to swing to a small profit in Oct-Dec from a year-ago loss, according to Thomson Reuters I/B/E/S. On a consolidated basis, Samsung’s LCD business will likely swing to an operating profit margin of about 8 percent in the fourth quarter from a loss of 5 percent a year ago, but down from a 15 percent profit margin in July-September, according to analysts. Samsung reports earnings on Jan 29. In the past two months, LG Display shares have jumped 30 percent and Samsung’s have risen 12 percent, compared with a 6 percent gain in Seoul’s broader market. AU climbed 26 percent versus a 7.5 percent rise in the Taiwan benchmark. Beside the confidence in Chinese demand, analysts also bet the global economic recovery would increase demand for larger LCD TVs in developed markets over the longer term. GUH Holdings Berhad, incorporated on 1 March 1961, is listed on the Main Board of Bursa Malaysia Securities Berhad under the Industrial Products sector. GUH Group is involved in several key businesses, namely electronic, electrical, property development, plantation and power generation. The core activity of the Electrical Division is trading of electrical goods and appliances, from switches to wires and supplies to retailers, contractors, consultants and DIY enthusiasts. This Division has also expanded into the trading of building materials such as floor, wall and roof tiles, sanitary wares, paints and metal frames for doors and windows. The Property Division is actively involved in its flagship property development project in Taman Bukit Kepayang, a well-mixed development township in Seremban. It is strategically located adjacent to the Seremban Interchange of the North-South Highway, a gateway to Seremban. The well-planned integrated development project comprises medium to high-end residential and commercial units. In line with its efforts to improve business growth, GUH has expanded into oil palm cultivation with a small size estate of 385 acres situated in Daerah Kuala Muda, Kedah. The Group also has an overseas investment in an associated company that operates a power plant in Cambodia. A summary of the quarterly financials is shown below. 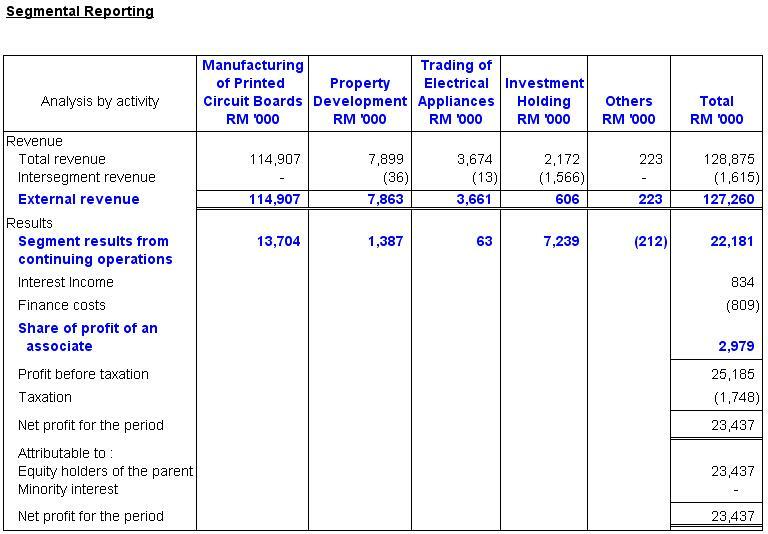 Dissecting their latest quarterly balance sheet, GUH is backed by a net cash per share of 52sen. 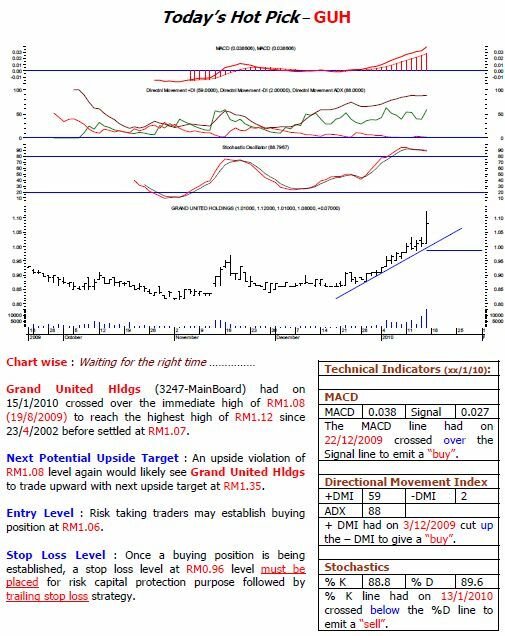 If the 22.5m shares bought back within the last financial year were to be cancelled, net cash will rise to 58sen per share. GUH, a printed circuit board (PCB) maker, which has secured orders received from major Japanese and South Korean companies, expects the group’s PCB production to reach its previous level of over 200,000 sq m in the first quarter of the coming year, compared with the current average of 140,000 sq m.
GUH Managing Director, Datuk H’ng Bak Tee said the level was prior to the onset of the global economic downturn from the third quarter of 2008, attributing it to the expanding market for LCD and light-emitting diode (LED) televisions. Possible share cancellation/special dividend of treasury shares of 1share for every 10 owned to be announced in February 2010. Aggressive share buyback as evidenced in 2008 and 2009. In 2008, GUH purchased 10% of its own shares and canceled them in Feb2009. 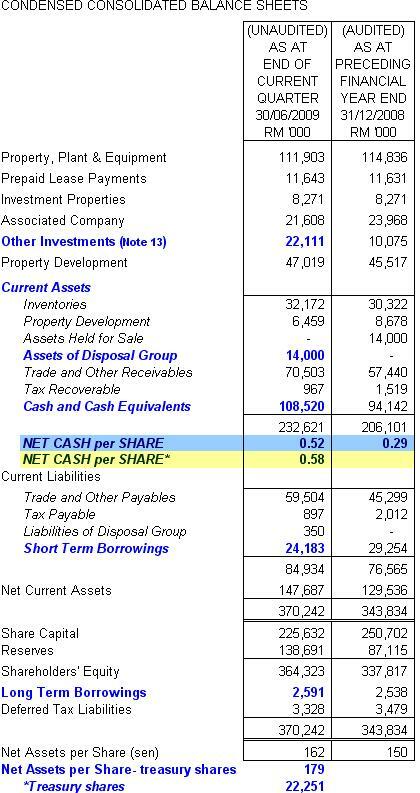 Cash per share backing of 52sen. At the current price of RM1.10, one is paying possibly less than 3x FY2009 PER. DISCLAIMER: The above opinion is not an invitation to buy or sell.